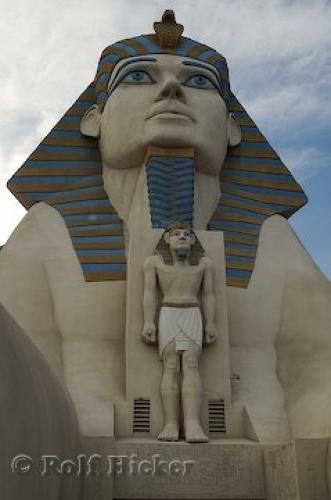 An Egyptian icon, the Sphinx at the Luxor Las Vegas Resort Hotel in Nevada. A replica of the great Sphinx of Giza in Egypt guards the entrance to the Luxor Las Vegas Resort Hotel in Nevada, USA, North America. Behind the Sphinx also stands a glass replica of the Great Pyamid of Giza which during the evening shines a powerful beam of intense light into the sky. The Sphinx has the body of a lion and the head of a king. Luxor Las Vegas Resort Hotel, Nevada, USA.